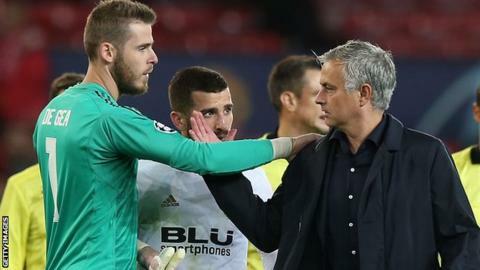 Manchester United manager Jose Mourinho is "not confident" goalkeeper David de Gea will sign a new contract - but says he is "not worried" by the situation. In August, United were positive over the chance of De Gea renewing his deal. He is committed to Old Trafford until the summer, with the club having an option to extend to 2020. "If the club want to be better than it is and not worse, obviously it would be very important to keep David," Mourinho told Sky Sports. De Gea, 27, was named in May as the club's player of the year for an unprecedented fourth time. Juventus have reportedly targeted the Spain international as another low-cost high-quality addition after picking up Liverpool midfielder Emre Can, Barcelona full-back Dani Alves, Bayern Munich midfielder Sami Khedira and Athletic Bilbao striker Fernando Llorente on free transfers in recent years. De Gea, who joined United from Atletico Madrid in 2011 in an £18.9m deal, is one of several players nearing the end of their deals with the Premier League club. France forward Anthony Martial, Spanish midfielder Juan Mata and Ecuador wing-back Antonio Valencia are also out of contract at the end of the season. Mourinho was keen to sign at least one central defender and a winger in the summer, but could not convince the board that his targets would strengthen the squad.